PLEASE NOTE : Since the last Template was Published, the Guest Speaker for November Friday Showcase has changed. 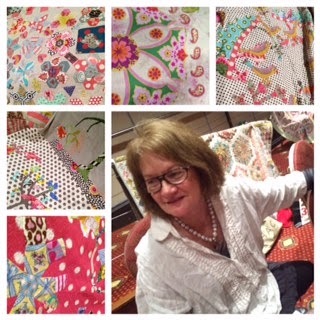 This month we will be welcoming Veronica Appleyard to the Guild Office to share her Quilting Story. A member of The Campbelltown Quilters Guild, she is never the less a relative newcomer to the Quilting world. Veronica was smitten by the bug in 2006, and has since gone from strength to strength as a business woman in this industry. Her initial foray was with Machine Quilting for customers, however the business has now grown into a online Kit and BOM facility named "Appleyard Cottage" being run from her home in Minto, South Western Sydney. 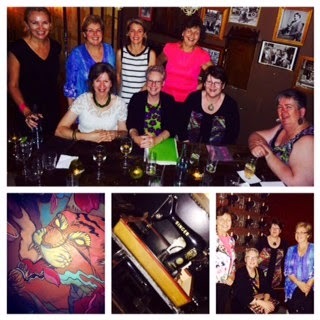 The choice of Stitch Bar in Sydney's CBD was inspirational for an initial social gathering of the newly elected committee of The Quilters' Guild of NSW Inc. Surrounded by rows and rows of old treadles bolted to walls, exotic wall art and dress pattern wallpaper, and tempted by a flamboyant cocktails menu, the President Linda Butcher and Vice President Amanda Daly ensured that the fresh Office holders felt like this was the start of a new adventure and that all would be inspired to move the guild forward within the Australian quilting fraternity. There is a large turnover of personel this year, all coming to to their positions with a wide range of skills, both creative and organisational. Congratulations to all elected members upon accepting the challenge to administrate this busy and flourishing guild. Class bookings for the 11th Australasian Quilt Convention open next Tuesday, 28 October at 10am Australian Eastern Daylight Savings Time. Information can be found on the AQC Website regarding Tutors and Classes. There is an extremely interesting line up of creative Australian and International tutors booked to help everyone broaden their textile horizons. These Workshops book out early, so please plan your trip today. Some of the Retiring Committee being thanked. A visual feast of all things "Red & White", due to the organisational skills of Robyn Shipton, greeted those members on Saturday who attended the 2014 AGM of The Quilters' Guild of NSW Inc.
President Linda Butcher was in charge of thanking retiring members of the Committee for their years of volunteering, and then welcoming the newly elected members. Margaret Sampson George, the "Maestro of Medallions" delighted all attendees with a talk about her quilting in Sydney from the early 70's, and the influences that overseas postings have had on her appreciation of colour and design. She is a force in the teaching world and continues to encourage others to seek a reflection of their own stories in their quilts. More than 40 'Mini Modern' Challenge Quilts were displayed for the first time and winners announced. All details will be in the November Edition of The Template. However, next year's Title Theme was announced : "Colour Collision"
Early details of next year's "Away" meeting were announced. Firstly there is a name change to "Country Meeting" so as not to be confused with the annual "Retreat" weekend. March 20-22nd 2015 are the dates and the destination is Tuncurry Forster. 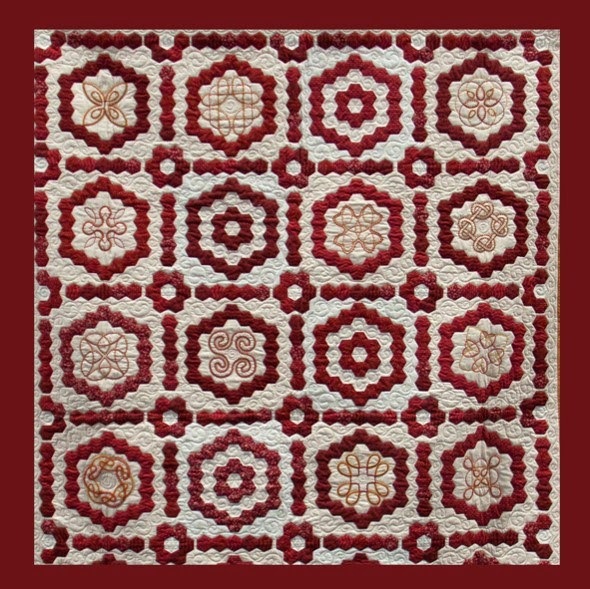 There will be a presentation on "What Judges look for in an Award Winning quilt" and the Guest Speaker will be Textile Artist, Jan Irvine - Nealie. Further details will be available in the November issue of The Template and Template Free (Guild Blog) however please be advised that there is a booking form Closing Date of December 12. A call was made for Crib and Bassinet quilts to be made for young patients in the Palliative Care unit of The Childrens' Hospital, Randwick. Boys, Girls and Unisex themes for the Under 5's are all needed, and a Guild co-ordinator has been appointed. Please phone the Guild Office for more details. A collaborative program between the Tasmanian Quilting Guild & the Tasmanian Museum & Art Gallery. The Tasmanian Art Quilt Prize Exhibition will be held at Narryna House , Tasmanian Museum and Art Gallery, at Battery Point in Hobart from the 6th until the 22nd November, 2015. ‘Narryna ‘ is a beautiful historic home that has a wonderful collection of antique textiles: quilts, clothing, toys, embroideries , linens and samplers. At first glance the theme may seem to focus on women in history but it is an ambiguous statement that may reflect stories in the modern world from a male or female perspective. The theme may be interpreted in many different ways. The Tasmanian Art Quilt Prize is open to textile artists across Australia. This biennial exhibition aims to promote best practice in art quilting and encourage experimentation by presenting new and exciting textile art. Entrants are sought nationally. The judging panel will draw up a shortlist from the images and the documentation supplied. The judging panel considers all entries and selects the artists who will be invited to present quilts for the final exhibition. All entrants will be notified of the first round of judging results by Monday 21st September, 2015. Information about your selection will not be available before this date. The judging panel may decide that no prize is to be awarded if the work is not of a required standard, or, if in its judgment, other factors necessitate this action. The judging panel’s decision is final at all stages of judging and no correspondence will be entered into regarding these decisions. • Entrants must submit quilts in accordance with the terms and conditions. The website of The Tasmanian Quilters Guild will have more information soon, alternatively, please email info@tasquiltguild.org.au or phone (03) 63763771 for Terms and Conditions and an Entry Form to be sent. No need to dress as Santa Claus . . .
. . . . however . . The Committee of The Quilters Guild of NSW Inc invite all members to wear Red and White attire this Saturday at the AGM. 2015 Red and White Challenge. 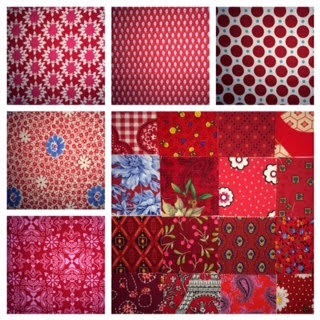 This fabulous quilt is instantly recognised as one fitting into the requirements of next year's Challenge, but are those fabrics really "red"? 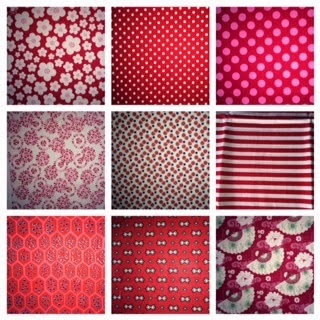 Actually, there is only one Red (with white or cream) fabric in the 30 examples above. Every other fabric includes pinks, oranges, greens, yellows, blues and/or black. Some inclusions are obvious and the fabric will never "read" as red, others, from a distance aren't so easily discerned. Members are invited to bring their fabrics to the AGM. "Red and White - Check it Out" White can be off-white, to cream. A wide range of reds will be accepted. "If in Doubt - Leave it Out" If you want to use a print with other colours it should still read as red. So if you're in doubt, leave it out. The Annual General Meeting ( 2014) of the Quilters' Guild of NSW Inc will be held on Saturday 18 October. All members are invited to attend. All committee positions will be declared vacant. Three current committee members will be standing for re-election, having nominated to return to their current positions, however, seven positions will remain vacant unless new nominees are elected. The AGM is always a wonderful occasion, as those stepping down from committee are duly thanked and applauded for their involvement in steering this organisation to cover the needs of all members, during their term. Please come and show your appreciation for the committee who are relinquishing their roles. Another happy event at the AGM is the Annual Challenge Quilt Display, announcement of 'Winner' and voting of 'Viewers Choice'. Almost 50 quilts are part of this year's Challenge : Mini Modern. At the AGM there is always a Guest Speaker, and this year members will be privileged to hear the quilting stories of the very talented Margaret Sampson. 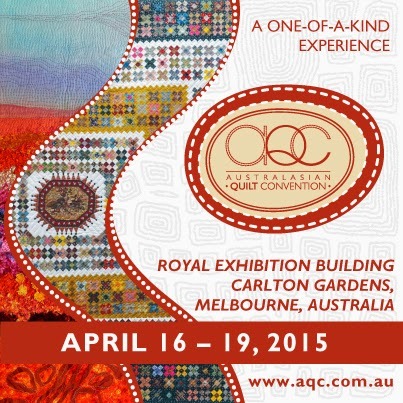 It will be extremely special to see many of her wonderful quilts altogether in one place. And for those who need to add to their "stash", 'Patchwork on Pittwater' will be offering interesting fabrics at their Market Stall. Please don't forget to bring completed and named BOQ's : the red and white Broken Wheel - 9 inch blocks for the draw, where, 'winner takes all'. Needlework Tool Collectors Society 2014 Conference. Then the following information might interest Quilters and Textile Artists alike. Members of the Needlework Tool Collectors Society are busily preparing for their 2014 Conference and invite all interested parties to attend on the weekend of the 25th and 26th of October. This group has meetings in 3 States, plus a Conference every second year. Many members are involved in a broad range of sewing, embroidery and craft areas, and the experience of working with useful and well-made tools often grows into a fascination with needlework tools of all kinds. Tickets need to be pre-booked. The Conference Dinner on Saturday evening will have Claudia Chan Shaw (from the ABC Programme : The Collectors) as the After Dinner Speaker. A Pincuchion Competition and Raffle are on offer, along with Members' own, sales tables. Conference registration 5-6pm, and an informal dinner in the evening. This 9 inch block, so easily rotary cut, is the Block of the Quarter and any delivered to the office of The Quilters' Guild of NSW Inc by Tuesday 14 October , or brought to the Annual General Meeting at Burwood on Saturday 18 October, will go into "the winner takes all" draw, at the meeting. Dont forget to add an identifying name to each block on a scrap of paper. "No name" will mean another block will be drawn, for a member to "win". Fabric colours need to be red prints set against a white background. 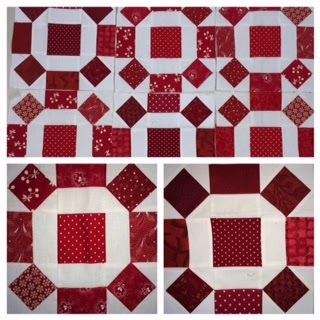 As can be seen, once many blocks are put together, a stunning Red and White quilt is produced, and this could be the beginnings of an entry (for the winner) in the 2015 Challenge : "Red and White"
Scraps dont have to match, therefore there is bound to be plenty of variety available in everyone's stash. Members are encouraged to make as many as wished. The block diagram, cutting and piecing directions are in the August 2014 edition of The Template. 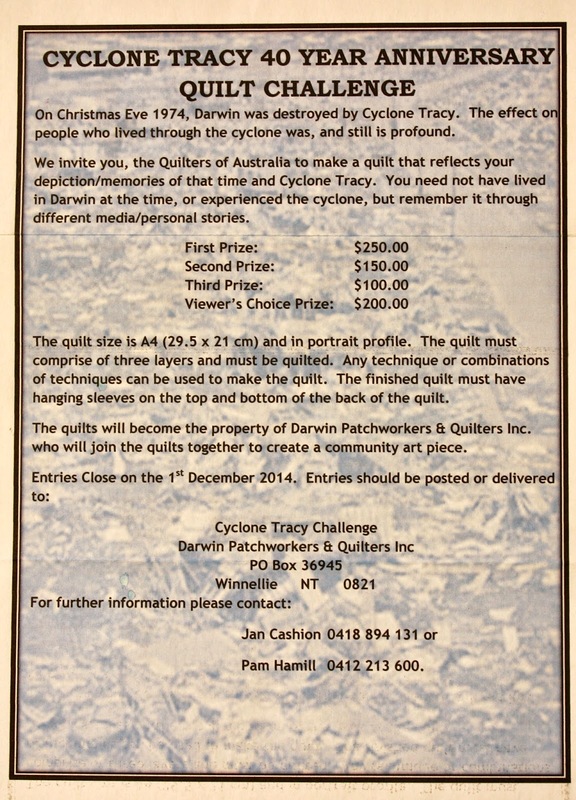 Quilters around Australia are being invited to make a quilt that reflects their memories of the devastation of Darwin when Cyclone Tracy unleashed her destructive force on Christmas Eve 1974. Participants in the challenge need not have lived in Darwin at the time nor experienced the Cyclone, but will have perhaps remembered it through media and other's accounts. Quilts must be A4 Size (29.5cm x 21 cm) and in portrait profile. Quilts must be 3 layers and must be quilted. Any technique or combination of techniques can be utilised. Finished quilts must have hanging sleeves both top and bottom of the back of the quilt. Quilts will become the property of Darwin Patchworkers & Quilters Inc.
Quilts will be joined together to create a community art piece.